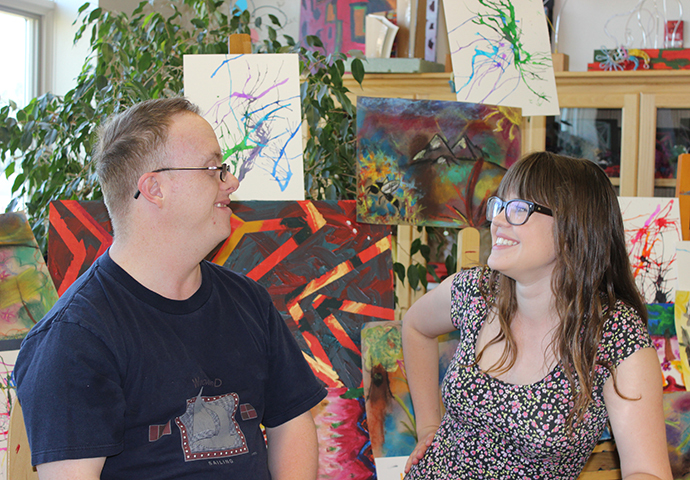 All students in the minor are required to complete three core courses, which have been designed to provide a strong foundation in disability studies. The first course, Introduction to Disability Studies (WIND 2100), introduces students to disability definitions, cultural meanings and representations, historical and contemporary rights issues, and to multiple perspectives of people living with disability. This course prepares students for Disability Studies Theory and Practice (WIND 4020), which explores the theoretical evolution of disability studies, legal and policy issues that impact people with disabilities, and national and international campaigns for disability rights. In this course, students also design research projects connected to their majors or professional fields. Finally, the Disability Studies Practicum (WIND 4500) provides students with an opportunity to spend a semester working in an environment with people with disabilities. Students have had placements with service providers, advocacy organizations, governmental agencies, and schools. These experiences provide students with tremendous opportunities to expand their knowledge about disability and gain exposure to professions they are preparing to enter. In addition to the three core courses, students are required to complete three elective courses related to disability studies. One of these courses must be offered by WIND, and the other two can be selected from other UW course offerings. External electives should be selected in consultation with your Disability Studies faculty advisor. Please work with the program director, Michelle Jarman, to select WIND and external electives. There is some flexibility depending on student interest. USP Codes are listed in brackets by the 2003 USP code followed by the 2015 USP code (i.e. [QB<>Q]). 2100. Introduction to Disability Studies. 3. [CH,D<>H] Provides students with an overview of the disability studies field. Students gain introductory knowledge about the disability studies perspective by examining the work of scholars from many academic backgrounds, which will facilitate students' understanding of the interdisciplinary nature of disability studies. 2500. Topics in:_____. 1-3 (Max. 6). Provides students with the opportunity to gain introductory knowledge by examining various topics in the field of Disability Studies. Prerequisite: Consent of instructor. 2700. Gender and Disability. 3. [D<>H] Disability studies draws upon critical theory to investigate disability as a discursive construction. Investigates how intersecting conceptions of disability and gender have shaped cultural meanings and the social positioning of specific groups, especially women with disabilities. Topics include non-normative embodiment, issues of representation and subjectivity, and the politics of health, sexuality, and care. Cross listed with WMST 2700. 4020. Disability Studies Theory and Practice. 3. [CS<>COM3] Explores the interdisciplinary nature of disability studies theory and scholarship, including investigation of embodied knowledge, cultural meanings, and socio-political practices related to disability. Students will develop in-depth critical disability research papers and deliver accessible, professional presentations. Dual listed with WIND 5020; cross listed with SOWK 4020. Prerequisite: WIND 2100 or WB/COM2. 4050. Independent Study. 1-3 (Max. 6). Offers the advanced student the opportunity to pursue a topic of interest with the direction of an instructor in disability studies. Dual listed with WIND 5050. Prerequisite: WB and consent of instructor. 4200. Diverse Minds. 3. Through investigations of novels, memoirs, films, and media representations of intellectual disability, autism/neurodiversity, and psychiatric disability, students critically analyze figurations of “unstable,” “unruly,” or what we will conceptualize as “diverse” minds. Dual listed with WIND 5200. Prerequisite: WIND 2100 or consent of instructor. 4500. Practicum. 3. Provides students practical experience in the field of Disability. Typically taken during a student's final semester in the Disability Studies Minor. Prerequisite: completion of WIND 2100, and WIND elective, WIND 4020 (or concurrent enrollment). 4990. Topics in:_____. 1-3 (Max. 12). Provides upper division/graduate students with the opportunity for critical analysis and in-depth examination of various topics in the field of Disability Studies. Prerequisite: Junior standing and consent of instructor. 5020. Disability Studies Theory and Practice. 3. Explores the interdisciplinary nature of disability studies theory and scholarship, including investigation of embodied knowledge, cultural meanings, and socio-political practices related to disability. Students will develop in-depth critical disability research papers and deliver accessible, professional presentations. Dual listed with WIND 4020; cross listed with SOWK 5020. 5050. Independent Study. 1-3 (Max. 6). Offers the advanced student the opportunity to pursue a topic of interest with the direction of an instructor in disability studies. Dual listed with WIND 5050. Prerequisite: WB and consent of instructor. 5100. Topics. 1-3 (Max. 12). Provides graduate students with the opportunity for critical analysis and in-depth examination of various topics in the field of Disability Studies. Prerequisite: upper division/graduate standing. 5200. Diverse Minds. 3. Through investigations of novels, memoirs, films, and media representations of intellectual disability, autism/neurodiversity, and psychiatric disability, students critically analyze figurations of “unstable,” “unruly,” or what we will conceptualize as “diverse” minds. Dual listed with WIND 5200. Prerequisite: consent of instructor. 5990. Graduate School Internship. 1-12 (Max. 24). Provides graduate students with the opportunity for internship experiences within the disability field.